The other night it was cold, and rainy, and dreary. There is only one option in our house when the weather is like that...SOUP. I love making soups! They are so versatile, hearty and filling. And best of all, soups feed a lot of people. I started with a vegetable that was new to me in soup-land, cauliflower. 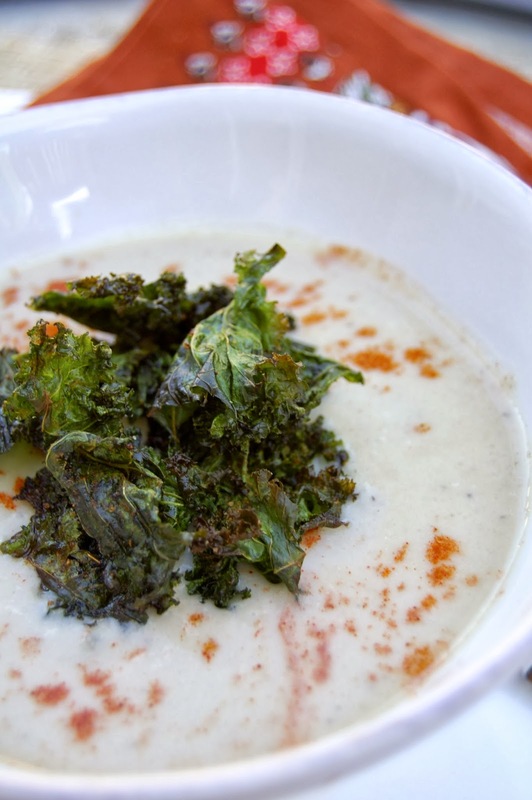 I love this cruciferous veggie, but have never made it the star of a soup...until now. This recipe turned out fantastic! I got a little inspiration from Rosemarried, a new blog I have discovered (and become quite fond of). This soup was very easy and quick to make. Once I got all the ingredients in the pot, I decided to make kale chips to go on top of the soup instead of croutons. I made the kale chips a bit spicy so it added more flavors to the soup. After 30 minutes, I had the soup, kale chips and a side of Shaved Apple and Fennel Salad for dinner. Hubby gave me a "hell yeah, babe" and we were off to yummy-town. Preheat oven to 350 for kale. Melt butter over medium heat in a large soup pot. Add the onions, garlic and shallots and sweat for 5 minutes, until translucent. Deglaze the pot with wine and stir well then add cauliflower, thyme and a pinch of salt. Cook for 2 minutes, while stiring. Add the stock, bay leaves and Parmesan rind and cover the pot. Simmer for 15-20 minutes, until the cauliflower is soft. On a large cookie sheet, add kale and drizzle sesame oil (or olive oil) and salt and pepper over. Toss to coat with your hands and massage kale for 1-2 minutes, until flavors are well distributed. Bake for about 15 minutes, tossing 1-2 times while cooking, until crispy. Remove and set aside. Watch carefully as they will burn quickly. Fish out the thyme and bay leaves from the soup pot. Using a immersion blender or regular blender, puree the soup. Stir in the cream if using and top with paprika and kale chips. Season with salt and pepper.